PG13 (as opposed to PGTips) had a birthday that needed to be celebrated, so off we went to have some pints and stuff ourselves with ramen. There's been a recent surge in ramen restaurants - we picked Tonkotsu as it seemed to be popular and it was conveniently located for both of us. Ordering was easy, aside from a slight indecisiveness over whether to get chicken karaage or gyoza. Gyoza it was (next time it will be chicken karaage), which was nice and crispy on the bottom, though I personally prefer my homemade ones, except for the fact that they take a lot of effort to make. 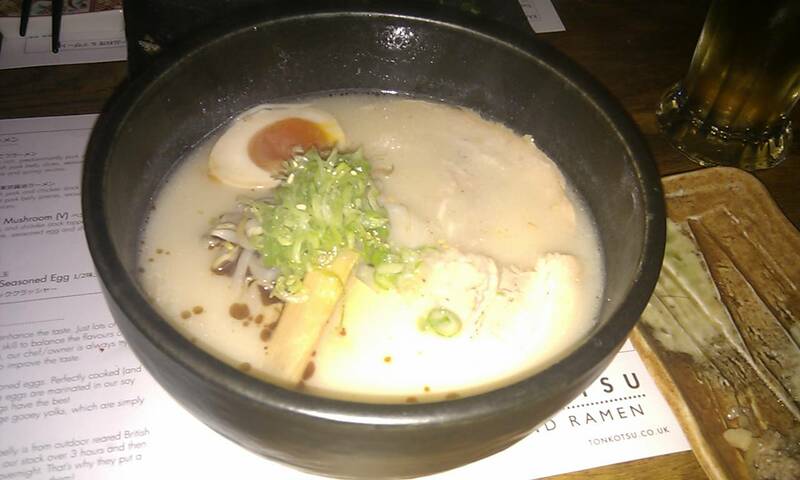 On to choosing ramen - we both went for the namesake tonkotsu. What came out was a soul warming bowl of goodness with the most delightfully soft-boiled egg floating in it. The picture above does no justice whatsoever. I am getting warm just thinking about this bowl of noodles with its porky essence.